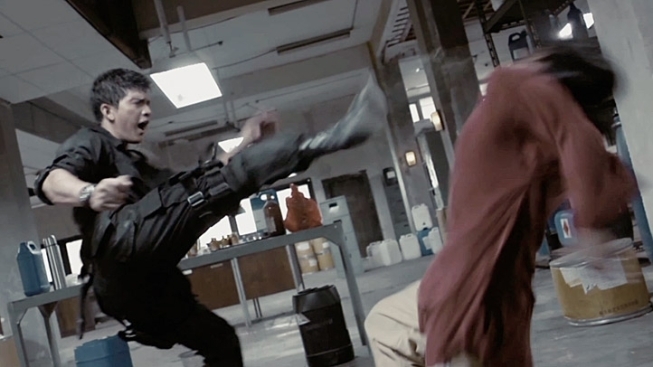 "The Raid: Redemption" has been blowing peoples minds across the festival for circuit for about a year now, with its relentless martial arts action and bare-bones style, and now it's ready to hit theaters on Friday. It's the story of an Indonesian SWAT team that storms an apartment building in Jakarta that serves as home base for a drug lord. The film is a pulse-pounding 101-minute thrill ride as we follow our hero, Rama, and his fellow cops as they fight their way, floor by floor, up to the kingpin's penthouse lair. What makes "The Raid" so unusual is that it was written and directed by Gareth Evans, a man who was born and raised in Wales but has made his name in Indonesia. How'd you end up in Indonesia? My wife is Indonesian-Japanese, and we were based in UK for a long time. She went to university in Europe, and we got married in 2006. I’d always wanted to be in the film industry, but I’d never really done enough, I hadn’t pushed myself forward enough to get noticed in the UK. I kept too localized, it was my fault. She put in a few calls back home, because she has family in Indonesia, and through her contacts she got me a directing job doing a documentary in Indonesia. And that documentary was bout Silat, the martial art that we use (in our films). That was the starting point. I went out there, found out what it was like to live and work out there, discovered a martial arts discipline I hadn’t seen before—I’m a big fan of martial arts films. But suddenly, I was seeing this new exciting thing for the first time, and through the process of that six months I came away from it I with traditions and culture I could use for my first storyline out there. An action discipline I was excited to explore, and I met Iko (Uwais) as well, who’s the star of the first film and the raid as well. What I love about it is it’s got a very sort of like fluid style, fluid appearance to it can be graceful, but at the same time very brutal as well. They way you move into a strike is beautiful to look at, then the result of that strike is pretty horrible to look at as well. It’s that juxtaposition that I really like as well. But also, it’s very adaptable to different situations, so you can be in a confined space or a wide open space; many attackers or just one-on-one, and there’s ways to deal with each situation. There’s a low center of gravity to it, so you’re looking at somebody, you’re fighting somebody eye-to-eye, then you just come down and take their legs and it’s over in an instant. I haven’t (done it) for a long time—I did for the first movie, I learned for about 10 months for the first movie. I knew I was working with the choreography team, I wanted them to feel that I came to it with some kind of background knowledge at the very least—an understanding of some of the movements, and the aesthetics of it as well, so that I’d feel comfortable giving them notes on things as well. The hard part is getting money. We finished our first movie, "Merantau," in 2009, and we spent from 2009 to 2010 trying to get the financing in place for a different film. We struggled for a year and a half—we couldn’t get any money. So "The Raid" was our plan B. "The Raid" was actually a lot lower budget than "Merantau" was, and to my mind it was kinda like, “Oh s***—I’m taking a step back. Our ambition was always to go higher, we always planned the action had to be 10 times bigger. Our approach is to make it bigger to make it succeed. But in the back of my mind, it’s still like a step down. But beyond the sort of budgetary thing, I’m a huge fan of films that are set in one location, action films especially. "Die Hard," you could argue "Hard Boiled," because the last 50 minutes is all in the hospital. "Assault on Precinct 13" is one of the best for me—it’s incredible. So what I did was look at all those different films for influence points and figure out structure. Figure out, OK what happens after your big set piece, then? How do you rebuild it up towards that next one? How to you build the tension? Or get the audience in the mood for when you pull the trigger and start that next fight? A lot of those films helped inform me of that. "Die Hard" was purely on a spectacle level, how can we keep ramping it up and up and up? I hate watching action films where you have this amazing incredible sequence in the first 10 minutes and then everything else feels like a whimper afterward. My preference is something that escalates—something that builds and builds and builds, get bigger and bigger as it goes along. So then that final fight sequence, it’s the f***ing best scene in the film. I’m excited (about the "Raid" remake). I think the storyline’s pretty streamlined, I think there’s a lot they could do with it. Things they could do differently. I just hope whoever directs it is given the same creative freedom that I had. That’s important. It needs a fresh pair of eyes to come to it. I can’t think of any more ways that I can kill people. For me, whoever does that job, I hope they get given that same freedom to explore it, not have someone looking over their shoulder every two minutes. The only limitation that I had was budgetary, and there were things I wanted to do in that film that I couldn’t afford to do. I’m going to start shooting (the sequel) in January—we’re taking it to the streets. I don’t want to do a sequel that just follows the same formula, and copies the first film. Whatever that was frightening and scary about that building and that boss in the first movie? A small fry in comparison to what were gonna do in the second. We’re gonna meet the higher-ups. It's a much bigger story as well. I do. I’d love to direct in the English language for a change. That would be nice. But I want to do something, but I want it to be right for me. I don’t have an interest to be plugged into some franchise or have some big-budget thing. I want to really feel something about the script, the storyline, and the characters. It’s one of those things where is Indonesia now, and it’s always gonna be Indonesia. I want to bounce between Indonesia and somewhere outside—one here, one there… And I got family back there, and if I’m going to naked a film, that means I’m not going to see them for a long period of time. If I’m not going to see my family for a long period of time, it’d better be f***ing worth it. So I don’t want to be a year and a half down the line and realize I hate the film I made. So whoever I work and wherever the story is, it’s because the people want my version of that film.